"Armed gunmen are blocking the road and have taken my car hostage," Roosevelt said in French! The demonstrators punctured all 4 tires of the vehicle which singer Jean Jean Roosevelt was in. 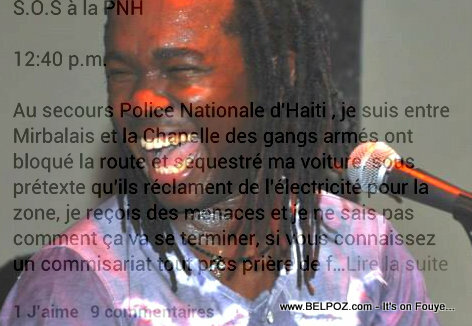 The artist appealed for help to the Haiti National Police present in the area. He says he received threats from the inhabitants apparently very angry. Bon lotrejou moun Dany Laferriere victim nan Potprens epi jodi a se Jean Jean Roosvelt? While I do hear your frustration and I do feel heartfully for Mr Jean Jean Roosvelt who may have experienced the meaning of doom at that moment, it leaves me nonetheless to recourse the experience of those who have and are again living under a police state. Ha ha! Nan tan demonrasi saa, kilès moun ki gen dwa/otorite pou met lòd nan dezòd?